Films starring child actors are a special kind of gamble. Done correctly, they can be iconic like “The Goonies” or “Super 8.” And then there’s everything else, the painful trash only children can endure (I’m looking at you “3 Ninjas,” you were always vile). 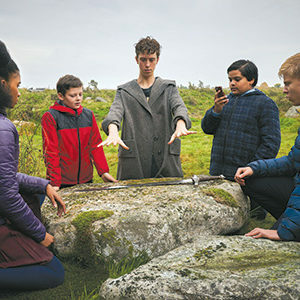 “The Kid Who Would Be King” somehow finds a third way, watchable, competent to a point, but not the instant classic it shoots for. King Arthur and the story of Camelot should be fodder for a blockbusting hit, but most attempts over the last three decades make the legend feel far too grounded. The closest to a win is BBC’s “Camelot” series, which is infuriating on several levels. But at its ending (spoilers, darling) presents a hint of a story never attempted on screen; an aged Merlin traverses the modern world waiting for the once and future king’s glorious return. 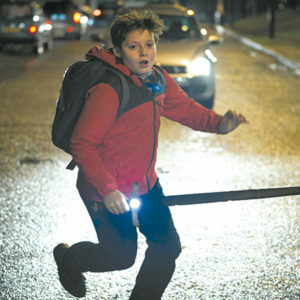 At least “The Kid” deserves credit for finally bringing this next chapter in the Arthurian legend to the silver screen. Alex (Louis Ashbourne Serkis, son of Andy Serkis of Gollum fame) has the spirit of a brave warrior, but he lacks the physical presence to strike fear in foes like bullies Lance (Tom Taylor) and Kaye (Rhianna Dorris). But his attempts at heroism still matter to bestie Bedders (Dean Chaumoo), who just can’t do magic tricks the right way (I wonder if that’ll be important to the story later on). Eventually, young Alex stumbles upon a sword protruding from a concrete block in a construction site. Of course, he liberates Excalibur, and with it he now must successfully vanquish a series of foes, lest sorceress Morgana (Rebecca Ferguson) enslave London once more. But Arthur Jr. won’t be alone. He learns most of his kingly duties from Merlin disguised as a teen (Angus Imrie), played by Sir Patrick Stewart when he sneezes, revealing his true form. And he soon knights Bedders and the bullies he secretly admires. Why director Joe Cornish took eight years to return to feature filmmaking, following cult favorite “Attack the Block,” is a mystery. He provided John Boyega with an incredible breakout role, complete with a memorable cast of teen misfits fighting back against aliens invading England. “The Kid” pales in comparison but can hardly be deemed a flop. Next to both “Percy Jackson” films and even the first two “Harry Potters,” it’s a magnum opus. That doesn’t mean it entirely works on its own. Some sequences feel too juvenile, embracing childish lingo and life lessons, while other moments perfectly capture a contemporary attempt at the classic tale. And yet again, the villain lacks motivation and a sufficient story arc. Morgana is just there, a creature with magical delusions of grandeur to vanquish. And the main four kids – Alex, Kaye, Bedders, Lance – are competent. Lance’s Tom Taylor almost makes up for his role in the abysmal “The Dark Tower.” But the real standout performance belongs to Imrie as Merlin. A knockout combo of quirky and wise, he embodies the film’s soul and sense of humor. Sure, Stewart is always splendid – mostly because he’s a delightful human in some cases (but his return to “Star Trek” makes me nerd out) – but he remains a background presence, spending his minimal time as the story’s sage, summing up moral points in key moments. The best part of “The Kid Who Would Be King” is Cornish’s return to the director’s chair. His sophomore feature lacks the lasting punch of “Attack the Block,” but he knows his way around a briskly paced adventure. And while King Arthur hasn’t won a cinematic victory in some time, this is still an enjoyable romp the whole family can enjoy, kind of.